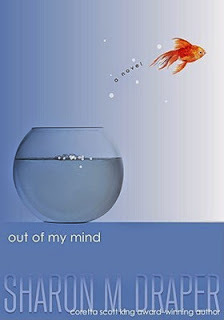 The book I read was, Out Of My Mind. When Melody joined a team that was competing on TV. I would just forgive my friends. It is the best book I have ever read. I think the cover is a creative idea. Yes, because I would love to see what happened to Melody. It reminds me of a book called, Wonder. What made you think of writing this book? Eleven-year-old Melody has a photographic memory. Her head is like a video camera that is always recording. Always. And there's no delete button. She's the smartest kid in her whole school, but no one knows it. Most people, her teachers and doctors included, don't think she's capable of learning, and up until recently her school days consisted of listening to the same preschool-level alphabet lessons again and again and again. If only she could speak up, if only she could tell people what she thinks and knows . . . but she can't, because Melody can't talk. She can't walk. She can't write.